You guys know I love going on my little trips and last month I decided to stay local and go somewhere different in Italy. This year I have done a lot of travelling but actually haven't been to that many places on Italy so it was about time really. We decided to go to La Spezia because it was close to the ocean as it's more a of a port town and only like a two and a half hour train ride from Florence so really handy. As La Spezia is obviously a port town, you all know that the best seafood you can get is by the port because it's so fresh. In all honesty there are a lot of places you can go but I would say if you can visit Dai Pescatori because the reviews are great and the food was yummy, we totally should have got more. It's such a popular place that there is a queue but I'm telling you the calamari and whitebait alone is worth it, but they also do a lot of other seafood dishes as well. However it's not a very formal place it, you won't be waiter on, you get your food and drink first and then sit down but it's perfect for lunch or a light dinner for the price! Before I even get started, if you have never heard of Cinque Terre then stop reading this post and just do a quick Google image search and then come back and finish reading...obvs! Cinque Terre is essentially 5 little towns along the coast that a built on the cliffs and are just so beautiful. To get to any of the towns from La Spezia is so easy, you can actually get trains cheaply or you can get a boat that drops you off at each one and takes you back to La Spezia! We definitely opted for the boat even though it was a bit more expensive 30 euros but I love boat rides and being on the ocean. I would definitely recommend visiting Manarola because it's just so pretty. Well obviously!!! 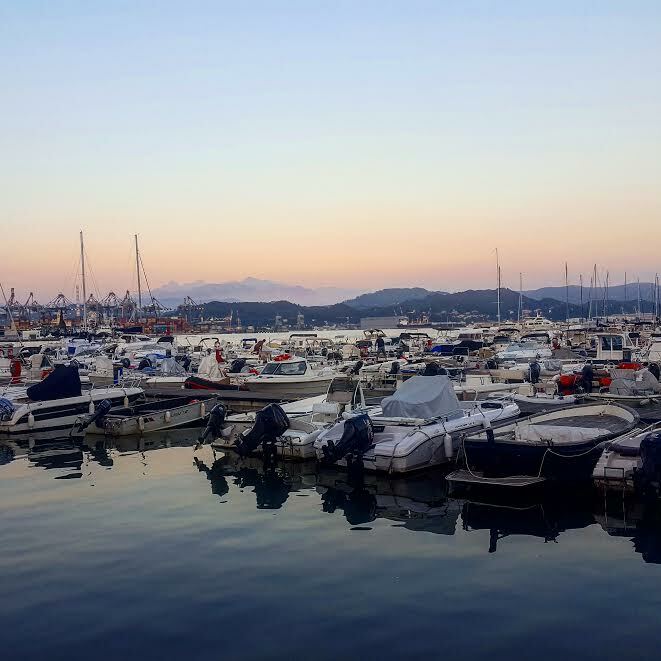 I know that's what you guys are thinking but the reality is La Spezia has a very relaxed vibe about it and I feel that sometimes it's just really nice to grab a drink and just watch the boats come and go. The port is pretty big and I probably only wandered just half of it but definitely made sure I stopped as some of the seafront bars along the way. I've told you guys before about Italy and their aperitivo, food when ever you order drinks, I'm a massive fan! We stumbled on this really cool bar called Kadinsky 900 just to stop for a drink and the aperitivo that was served with it was by far one of the best I have had in Italy and they didn't even increase the price of the drinks to include the food like some places do! There was two of us and we go these amazing little foccia sandwiches, 3 different fillings, crisps, nuts and beans! So yummy! The bar staff were so lovely and welcoming! On a side note the foccia in La Spezia is beyond amazing! Seriously guys, it's like 3€ for a glass that would be considered a large glass of wine! The thing I noticed was that La Spezia is way cheaper than the likes of Florence, Pisa or even Bologna! I've always been a fan of prosecco but even more so now in Italy, not only does it taste even better but when the sun is setting on the port after a long hot day, there is literally nothing better. If prosecco isn't your thang, don't worry they do lots of beer which are around 4€ so you can't go wrong really. There we have it, I would say that La Spezia probably has a slightly older demographic but if you're looking for a little weekend away somewhere then you should really check it out! We spent 3 nights and rented an airbnb apartment and had a great time! What sea side towns do you love?